Tacitus (56-117 A.D.) - There are many important historians from the Roman era between the end of the republic and the height of the empire. Several of them are listed on this chart and most of them are referred to in one place or another. Tacitus is widely regarded as one of the greatest of all Roman historians. In addition, he also served as a senator, albeit at a time when senators had little power. Like most historians in antiquity, not a lot is known about his personal life as historians wrote about others and not themselves. Likewise, while they were alive, most historians usually were not famous enough to be written about. Even his full name is in question. Either it was Publius Cornelius Tacitus or Gaius Cornelius Tacitus; so he usually is referred to only as Cornelius Tacitus, or simply Tacitus. What is known is that he may have come from a once wealthy family. Many patrician families who opposed those in power during the upheaval of the civil wars had their wealth confiscated by the state. 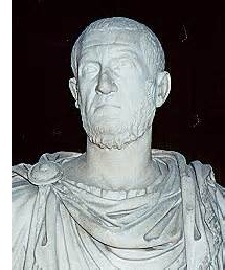 At the beginning of his Histories, Tacitus credits the Flavian emperors for his elevation, indicating that his family may have been one of those targeted; but then was later restored under the new dynasty. He also apparently was good friends with Pliny the Younger as evidenced by the letters he wrote to Tacitus (see Vesuvius eruption above). His two major works, the Annals and aforementioned Histories, covers almost the entire first century, from the beginning of the reign of Tiberius until the end of the reign of Domitian. He also wrote Germania, which provides insight into the Germanic tribes during the early Roman Empire. Tacitus is also of particular interest to Christians as he is one of the few extra-Biblical sources who refers to Jesus Christ in his writings.